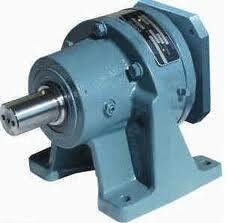 Cycloidal (planocentric) Gearboxes employ eccentric motion to achieve its speed reduction. It uses noncircular or eccentric motion to convert input rotation into a wobbly cycloidal motion. This motion is then converted back into a circular output rotation. During this process, speed reduction occurs. Unlike Harmonic Drive® products, which employ a flexible cylinder that doesn’t move in its entirety but stretches to mesh with the internal circular spline gear to achieve a type of cycloidal motion, the cycloidal (planocentric) drives will actually move the entire internal gear in an eccentric motion.